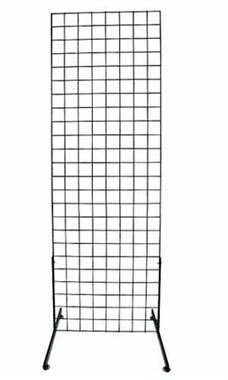 This Black Standing Grid Screen is a convenient way for you to easily build displays! These Standing Grid Screens are simple, versatile & portable merchandisers that will easily help to sell your products! The Unit includes one 24''W x 6'H grid panel and 1 set of grid legs. However, the shelves, brackets and Faceouts are sold separately but can also be purchased through Store Supply Warehouse. Tailor your display to your needs by accessorizing with our wide assortment of wire grid brackets, shelves, and peg hooks. In stock and available for immediate shipment. We really like this inexpensive grid wall. We replaced our gondolas with them to open up our area. Mostly we liked the customer service we received. The grid got lost in transit and once we called they sent new grid out immediately. thank you. This display is worth every penny. It is very sturdy and holds a lot of stuff. I am so glad I bought two of them. Will definitely purchase more in future. Stout double sided grid stand doubles display square footage, keeps merchandise in easy reach of customers, and is portable. I'm surprised to see the reviews on this. Maybe they've improved it since I bought mine. I've found it to be difficult to transport and the legs are unstable. The screws for the legs never quite fit, so it's a little unsturdy. I'm looking for something to replace it. Easy to assemble and carry from place to place. I love it, displays my items at the crafts shows perfectly, should've order it a year ago, I've bought 3 more, I highly recommend this product!!! Great asset to my vendor booths! Attractive finish, easy to assemble & disassemble. Gridwall is essential to a professional looking vendor tent, and these are perfect! Screen is sturdy but lightweight enough that I can carry it myself. Will add a new dimension to my display! I can configure and reconfigure my display with ease with this Screen. This is one of the best purchases I have ever made! This grid screen is perfect for a small space because you can display lots of items on it. I've used the wire cap displays down one side and still have 3/4ths of the total grid left for other stuff. Easy to assemble. Like the sturdiness. Product arrived earlier than expected and was exactly what we were looking for. Would definitely purchase items from Store Supply again. Thanks! I love this display. It has given me a way to display my merchandise and build my customer base. It places my product out front for all to see. Great to have. Just perfect! Perfect for my pop up shop display.I will eventually order more. Came right on time as stated.